Marshes, hardwood swamps and wet thickets (e.g., alders and willows); meadows, wet depressions, swales, and ditches; borders of streams, rivers, and ponds. The narrow remotely denticulate leaves (barely more than a gland for a “tooth”) are similar in shape to those of Salix exigua. Occasionally the stems and leaves bear fine spreading pubescence [f. villosa (Schumach.) Pennell] but the leaf shape will readily distinguish this species from others. 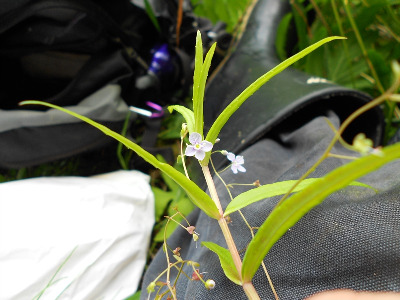 A zigzag axis of the raceme, with its long filiform pedicels soon reflexing, and the general sprawling delicate habit are characteristic of the species. MICHIGAN FLORA ONLINE. A. A. Reznicek, E. G. Voss, & B. S. Walters. February 2011. University of Michigan. Web. April 26, 2019. https://michiganflora.net/species.aspx?id=1984.